Is cash the underdog this Chinese New Year? Before we begin...Happy New Year! Xīn nián kuài lè! 新年快乐 The Chinese New Year Festival has begun! Time to welcome the year of the Dog! Chinese New Years fell on Friday, February 16th, 2018 and lasts a week but the Spring Festival holiday period traditionally covers 23 days in total. Beginning with Chinese New Year Eve falling on February 15th this year, the celebrations won't end until the awe-inspiring Chinese Lantern Festival on March 2nd, 2018. Click here for more information on Chinese New Year dates, greetings, decorations, taboos and more. One-quarter of the world's population celebrates the Spring Festival by cleaning their homes, hanging red lanterns and coin chimes, cheering on epic fireworks and lion dances, but most importantly, meeting their loved ones and exchanging the famous red envelopes enclosing printed luck: Cash. The tradition of giving and receiving these cash-keeping red envelopes, (called hongbao in Mandarin, lai see in Cantonese and âng-pau in Hokkien) is treasured across Asia. However, Fintech has been seeping into this ancient tradition with digital payment giants like Alipay and Wechat including digital red envelope animating what can only be summed up as 'e-hongbao' offers. Typically, older generations give red envelopes containing cash to the younger generations, but according to folklore, the tradition of exchanging banknotes came from parents giving their children golden coins wrapped in red paper as protection against dangerous spirits. From a child's tooth fairy to a wedding 'money dance' and a dead man's boat ferry fee, cash has played a key role in traditions all over the world. The Chinese New Year Festival is no exception. According to folklore, an evil spirit named Sui was feared for his attacks on sleeping children every Chinese New Year's Eve, so parents would have to think of ways to keep their children from falling asleep. One family gave their youngest boy eight golden coins to play with throughout the night, but as the night dragged on, both the parents and their child drifted into sleep. Sui snuck in and reached for the child's forehead, but a blinding light bounced off the coins and scared the evil spirit away. As it turned out, the coins were hiding eight protective spirits. Since then, coins and banknotes are deified, seen as more than just lucky tokens, but protective blessings and symbols of love. And thus a tradition was born! Every year, billions and billions of red envelopes keeping cash are exchanged. Grandparents spoil their grandchildren, bosses show appreciation to their employees, parents treat their children and their friends' children and excitement for the new year is enriched by the face to face exchange over the excitement for the new year. Each year, a different animal from the Chinese Zodiac is honoured, and 2018 spring festival celebrates the year of the dog. Is 2018 the year of cash as an underdog? Despite their campaigns, cash is still king during this ancient cash tradition. There is said to be no rule in terms of the amount that should go into a hongbao, as the act of giving a red packet is meant to be a gesture of blessing and not a transaction. Bank branches across Asia face skyrocketing demands for cash every year. Not only cash but particularly crisp new banknotes. Approximately 1.3 billion people in China and over 600 million people across Indonesia, Philippines, Vietnam, South Korea, Malaysia, Taiwan, Brunei, Singapore, Hong Kong and Macau observe public holidays in honour of the festival, which means that the custom of hitting the banks for cash begins well in advance of the festival yet continues throughout. The celebrations also extend beyond Asia. In 2015, 500 thousand people were estimated to have come together to celebrate the event in London's own Chinatown. Cash is king during Chinese New Year, with gift-giving in the form of ‘red packets’ a major driver. China’s central bank set up a temporary liquidity facility to supply more cash to commercial banks ahead of the holiday, allowing them to lower their reserves with the People’s Bank of China in an attempt to steady activity in money markets. Banks have been able to use up to 2% of their cash reserves for 30 days to cover the short-term liquidity issues over the period. 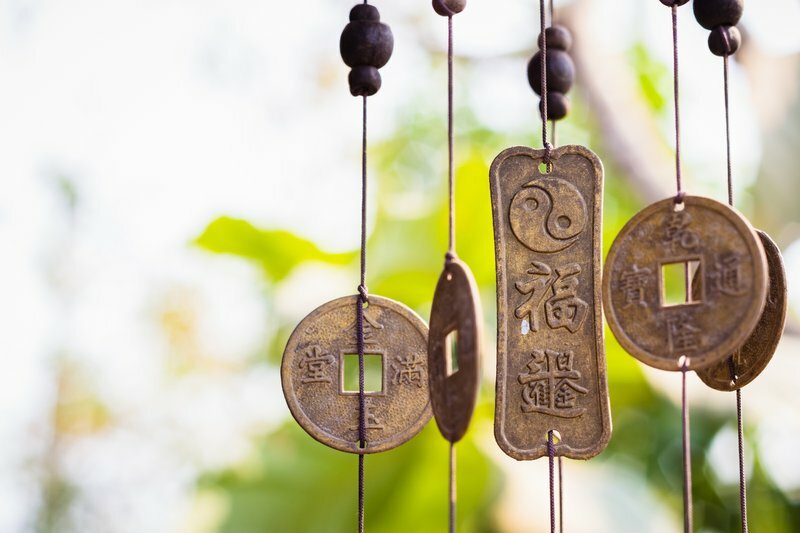 Old Chinese coins often used for hanging chimes for good luck, prosperity and to repel bad spirits. Ritchey, RR. 'Lucky Money in Red envelopes for Chinese New Year.' EzineArticles. Electronically published January 18, 2010. Accessed February 22, 2018. Shumin, Liao. 'Alibaba, Tencent Devise New Weapons as Red Envelope War Looms'. Yicai Global. Electronically published February 6, 2018. Accessed February 22, 2018. Warner, Joshua. 'How does Chinese New Year affect markets?' IG Group. Electronically published January 30, 2018. Accessed February 22, 2018. Zhou, Winni and Yao, Kevin. 'China central bank frees up cash for banks ahead of Lunar New Year.' Reuters. Electronically published December 18, 2018. Accessed February 22, 2018.